Geli Mikhailovich Korzhev (1925 – 2012) is recognized by contemporary Russian art historians as one of the most influential painters of the second half of the 20th century; his work has influenced the style and subjects of two generations of post-WWII Russian artists. 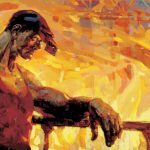 In collaboration with curators at the State Russian Museum (St. Petersburg) and the State Tretyakov Gallery (Moscow), TMORA will present an exclusive retrospective exhibition of 61 paintings that includes exceptional examples of Korzhev’s paintings from all segments of his remarkable career. 16 of the paintings are on loan to TMORA from the two largest Russian national museums. TMORA will dedicate its entire exhibition facility to this exhibition that represents the first solo exhibition for a single artist at the museum. This exhibition includes representative examples of works from every stage of Korzhev’s artistic life.